The LA Clippers are the biggest surprise in the league. Just ask Vegas. The Clips are on pace to win about 18 more games than their preseason over/under projection. It's the biggest such deviation in the NBA, and it's all thanks to an efficient offense engineered by Doc Rivers and fueled by the breakout performance of Tobias Harris. Here are the key stats: The Clips rank sixth in offensive efficiency and fourth in true shooting percentage (TS%). Those are impressive marks for any team, let alone a group of misfit NBA players most experts predicted wouldn't make the playoffs. It all starts with Harris, the team's leading scorer, who at 26 is suddenly blending volume and efficiency like a bona fide superstar. If you think that's an overstatement, consider this: Thirty-one NBA players have attempted at least 300 shots this season, and Harris leads all of them in effective field goal percentage. Keep in mind that group includes Kevin Durant, Klay Thompson, Kyrie Irving and LeBron James. 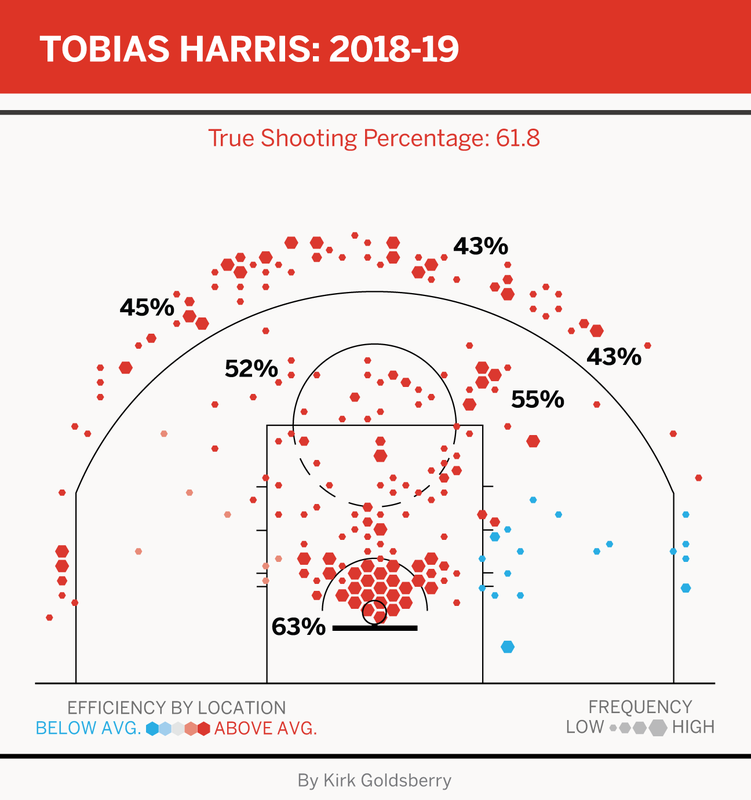 Harris' early-season shot chart looks something like 2011 Dirk Nowitzki. He is hitting everything from everywhere, and if he keeps this up, he's going to get paid max money in free agency next summer. This is the shot chart of a superstar, but is it sustainable? Harris looks like a completely different offensive player from the inconsistent journeyman who bounced among four teams in the first six years of his career. He appears to have settled in nicely in Los Angeles. Give some credit to Doc Rivers for cracking the code after other organizations failed. Rivers and the Clips love pick-and-rolls, and Harris is now a centerpiece in the love affair. Per Second Spectrum, Harris is the ball handler in nearly 16 pick-and-rolls per game this season, more than twice his mark last year. It's working, as Harris yields an impressive 1.15 points per play he finishes after using a pick, which is the best mark on the team. At 6-foot-9, Harris is big enough to power through smaller defenders, but he's also fast enough to blow by slower bigs. This season, he has been using screens set by Marcin Gortat and Montrezl Harrell to attack the core of the defense. If the bigs lay back, he has been hitting his pull-up at Nowitzki-like rates; if the bigs dare switch, he's fast enough to beat them to the rack. In an era increasingly obsessed with stretchy bigs and endless pick-and-pops, it's refreshing to watch Harrell and Gortat dive toward the hoop after screens and threaten the interior. 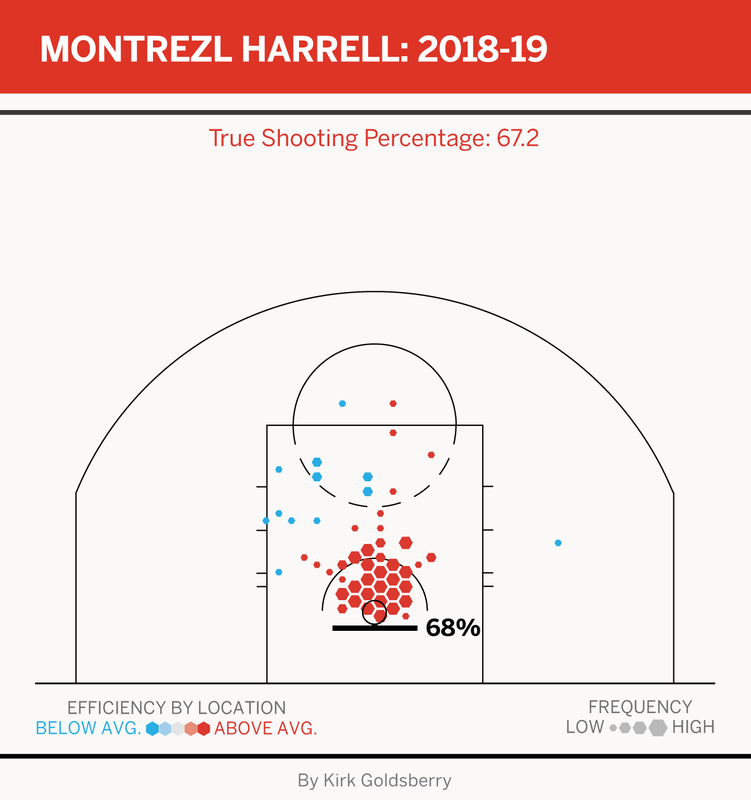 Harrell, in particular, has been awesome. After losing DeAndre Jordan to free agency, the Clippers appear to have struck gold in the bargain bin by keeping Harrell on a delectable two-year, $12 million contract. He's essentially replacing Jordan's offensive production at a fraction of the cost. Hardly anyone could replace Jordan's rebounding, but Harrell is averaging 15.8 points and a respectable 7.4 boards per contest, all while posting a ridiculous 67.2 TS%. In a way, Harrell's game is a perfect microcosm of the Rivers ecosystem: simple yet efficient. The Clippers aren't going to finish the season atop the Western Conference. Everyone is still chasing the Golden State Warriors, and the Clips are fourth in the conference in net rating while feasting on home wins. But if they can keep scoring at these efficiencies, they're going to make the playoffs. What kind of player makes a greater share of his 3s than his 2s? Danilo Gallinari, that's who. Regardless, Gallo provides the team with vital spacing that helps open the floor for all the pick-and-rolls Rivers is running. To this point, the Clippers are an ecological success -- a group of castaways and forgotten talent coalescing into something much greater than the sum of its parts. But while they are a pleasant surprise, they're also a fragile one. Rivers deserves loads of credit for this great start, but some of these numbers should level off. Harris' jump-shooting efficiency, Gallo's long-range proficiency and Harrell's productivity all seem too good to be true. Those are the fragile legs of the stool right now, but it's still the tallest stool in the unpredictable West. The goal for these Clippers isn't a title. That's out of reach. But they're certainly looking competent enough to have a chance at recruiting one or two high-profile free agents in the summer of 2019. That's their best path to a higher ceiling.